The rest of us have been on the bandwagon for Katniss Everdeen’s (Jennifer Lawrence) inevitable clash against President Snow (Donald Sutherland) and the Capitol since the hero was plucked from District 12 and dropped into the first Hunger Games back in 2012. 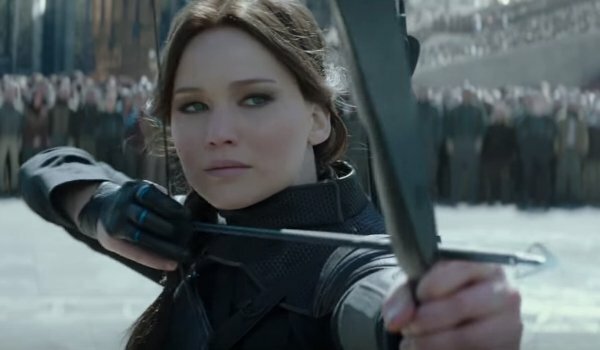 The latest trailer – billed as the Final trailer for Mockingjay Part 2 -- paints Snow as the root of all evil. "Stop killing for him," pleads Katniss. "Tonight, turn your weapons to the Capitol. Turn your weapons to Snow." And that is what we have been anticipating ever since last year’s The Hunger Games: Mockingjay – Part 1 concluded. Katniss finally had been pushed to the brink by Snow, having seen what he had done to her dear, beloved Peeta (Josh Hutcherson). This sequel promises the carnage, the bloodshed, and the action that has been building through three previous movies. And based on the fact that Finnick (Sam Claflin) describes this battle as "the 76th Hunger Games," it’s likely that key players will lose their lives in the fight. Now, check out J-Law rocking the incredible eyeliner as she braces to put an arrow somewhere in the vicinity of President Snow’s coal-black heart. For real, though, who does this trailer benefit? The Hunger Games series has a massive fanbase, and each and every one of them has had November 20 circled on his or her calendar, knowing that the conclusion to the series they’ve supported the past three years was drawing to a close. You’d think that Lionsgate would want to preserve a modicum of secrecy around its final chapter, so showing ANY footage from Mockingjay – Part 2 seems unnecessary. I think you can sell just as many tickets with a still-frame photo of a smiling Jennifer Lawrence, holding up a sign saying, "Come see me say goodbye to Katniss, fans!" Boom. Printing money. The Hunger Games: Mockingjay – Part 2 brings the dystopian YA franchise to a conclusion when it drops in theaters on November 20. You’re going, right?